Ahti knives are back to stock! At MyGoodKnife you can buy whole range of Ahti knives. 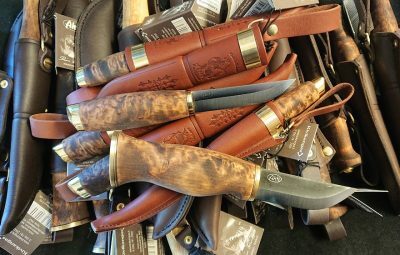 These Finnish “puukkos” will meet your needs for a utility knife, hunting knife, bushcraft knife, or general uses while you are enjoying the outdoors. Ahti puukko knives are handmade by well-known knife-maker, Reino Kamppila in Finnish town Kauhava. Name of brand “Ahti” – is the name of a Finnish mythological god. All Ahti blades are manufactured by the Finnish company Lauri Metalli. Most models are made of carbon steel (Carbon specs are: HRC 59, CO-83, Mn-0.57, VO-20, Cr-0.60). Some Ahti knives models (marked RST) have stainless steel blades (Stainless specs are: HRC 57, CO-479, SI-0.37, Mn-0.38, Ni-0.09, Cr-14.53, Mo-0.51, PO-0.19). Handles of Ahti knives are made from curly birch and stained a dark brown color. Handles of stainless blade knives are left the natural color. 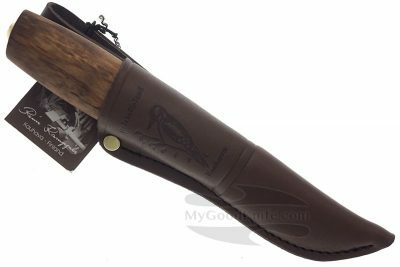 Ahti sheaths are made from vegetable tanned cow leather. 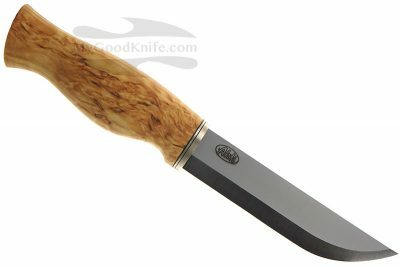 Shop for Ahti knives at MyGoodKnife! We offer free worldwide shipping for orders over 100 euro.